Are you attending ICANN 57? We’re happy to share some facts that might come in handy! If this is your first trip to India, we can bet you are at least concerned about a few basic things such as travel, food and emergency contacts. But don’t worry! We’ve collated a few handy facts, which will help make your stay safe, fun and comfortable in India. ICANN 57 – Namastey from India! This year, the ICANN fraternity is heading to India! The ICANN 57 Conference will be held at the Hyderabad International Convention centre (HICC) from November 3 to 9, 2016. Being the 3rd ICANN conference of 2016, this 57th edition is going to be immensely special for us because this time, we get to play the hosts! Hyderabad is one of the biggest metropolitan cities in Southern India and is the 4th most populous city in India. The people of Hyderabad are known as Hyderabadis, mainly comprising of the of Telugu speaking community. However, Hindi and English are the 2 widely spoken languages in all parts of India (you can breathe a sigh of relief!). But when in India, do as the Indians do! 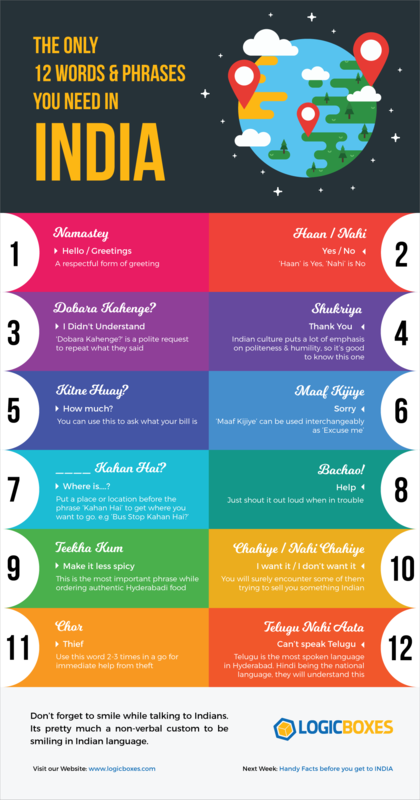 We’ve prepared a list of 12 Hindi Phrases which are good to know when you’re in India. So equip yourself with some basic knowledge of Hindi in less than 12 minutes! Hyderabad is known as the city of Mughals and Nizams. Look forward to get intoxicated with a royal charm that this city beholds. We really hope that you enjoy your stay in India. Along with this, we’ve reworked on the Promo table and also added in some nifty features. So there you have it. 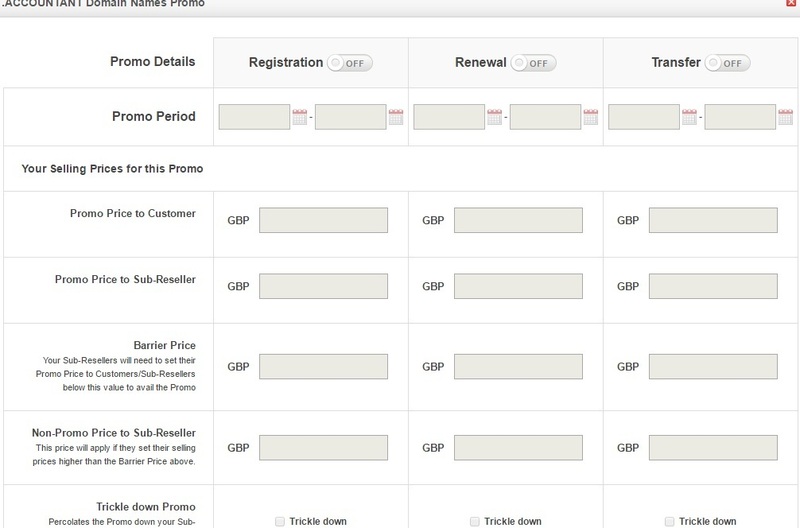 We will keep adding new features to enhance your user experience on our system. If you’d like to suggest changes to our interface, we’re all ears. Feel free to reach out to us at marketing@logicboxes.com. Meet Us Across the World this Spring! 2016 has just begun and our calendar’s brimming with event dates already! APTLD (Feb 18 – 19) – We begin with the APTLD (Asia Pacific Top Level Domain Association) 2016 Conference. APTLD has been a key symposium for networking, discussing and gaining insights about matters pertaining to the ccTLD Registries in the Asia-Pacific regions. Clifford deSouza will be attending the conference and you can catch him at the panel discussion on “Engaging Registrars in Marketing” where he’ll be talking about ways for ccTLD Registries to effectively engage Registrars in promoting their TLDs. AfriDNS (Mar 4 – 6) – Next up, we’ll be attending the AfriDNS (Africa Domain Name System Forum) at Marrakech. The AfriDNS Forum is an annual event that gathers Registries, Registrars and other stakeholders in Africa. You can catch Clifford deSouza at the event networking with ccTLD Registries on how they can further grow their namespace. ICANN 55 (Mar 5 – 10) – Soon after AfriDNS, we move on to attend the first ICANN event of the year – ICANN 55 at Marrakech. Like every year, we look forward to meeting all the large players from the domain industry. Siddharth Taliyan, Tania Castelino and Clifford deSouza will be present at our booth to discuss business growth opportunities for New gTLDs, ccTLDs and Registrars, alike. WHD.global (Mar 15 – 17) – Year after year, WorldHostingDays – the world’s largest Hosting and Cloud event, continues to remain a world-class Hosting conference. This year too, WHD.global is all set to bring together leading Hosting experts under one roof at Europa Park in Rust, Germany. Siddharth Taliyan and Eeshaan Satwalekar will be taking part in a panel discussion and an expert speaking slot, respectively, to talk about latest trends in the industry and how Web Hosts can boost their business. Our Head of Account Management – Ravneet Bawa, will also be available at our booth to discuss high-value business strategies. So if y’all are going to be at the event, do feel free to swing by booth F01/F02 to meet us and collect some cool schwag! We’re excited to attend these events and we’d love to meet you there. If you’re planning to attend any of these conferences, you can schedule a meeting with us right now or simply drop by our booths to say hi! Rocking ICANN Dublin with the Registry Rendezvous! We’re back from ICANN Dublin – one of the most exciting and exhilarating ICANN events in the recent times! Between 4 days of meetings & business talks, we did manage to take some time out and spread a little cheer within the community. The second edition of our Registry Rendezvous brought a fabulous evening filled with candid conversations, laughter & exciting company to the ICANN event. Fortunately, what happens in Dublin, does not stay in Dublin.. and that’s exactly why we bring to you all the moments from the Registry Rendezvous! Check out all the pictures of the party on our Facebook Page! The highlight of the party was the awards ceremony to felicitate our numerous partners, who’ve been with us for over a decade, celebrating the amazing relationship that we’ve shared with them. We’ve always lived by the axiom of maintaining a client-centric culture and we were overfilled with joy to see how this tiny gesture went on to bring a huge smile on our partners’ faces. That’s all folks! See you at the next ICANN event in Marrakech.